I appreciate that they trust me on this and ask for advise since I've been in the same situation before. I need to give honest answer based on my experience and my understanding. I've checked the blog that they give me and did some observation. I can say that most of the blog that being used for Google AdSense application are still have some gap in basic quality of a blog for Google AdSense. In this case i have to tell the truth and give some suggestion. There is one blog though that has relatively better design, visitor, organic traffic, but still has not been approved for Google AdSense. I suspected there are some articles that violate Google policy. I'm still waiting for his progres of Google AdSense application. So in this article i would like to share my understanding about basic quality of a blog a be participant of a Google AdSense program in answering BloggerBegins's visitor. 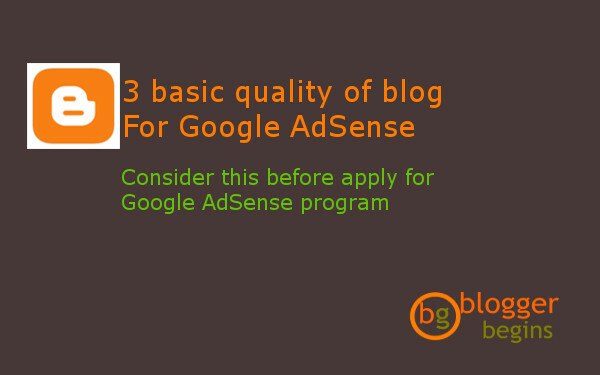 I hope this article can help other blogger in assessing their blog and re-consider before applying Google AdSense program if they found any gap from these three basic quality. Before we continue to the quality of blog that eligible for Google AdSense application, we need to understand how the AdSense program works and who are the stake holder of this program. Google AdSense is an advertisement program manage by Google. Google gives a change to blog owner to display advertisement from Google's client. There are at least 4 stake holders involve in this program. Google's client deposit some money to Google AdWords program. This program allowed customer to select specific keywords and display the advertisement on related Blog that has become Google's partner through AdSense program. The visitor come to the blog and see some advertisement on the blog. Whenever the visitor click the add, the deposit from Google's advertisement client is reduced. Google get paid and transfer some credit to the blog owner. So it is as simple as that. Right now we as blog owner apply Google AdSense so we can have some advertisement displayed in our blog and get some money in return. Google as the owner of this program has to select which blog that eligible to display Google AdSense. So what is the Google's advertisement client expectation? The expect some profit from the advertisement. The hope that by joining Google AdWords, they can boost their sales in return. They select spesific keyword related with their business in AdWords program. They expect that their advertisement will be placed in blog that has a lot visitor and relevant to their business. In common sense Google will select only the blog that has visitors, a lot visitors. Without visitors the advertisement program will not work. 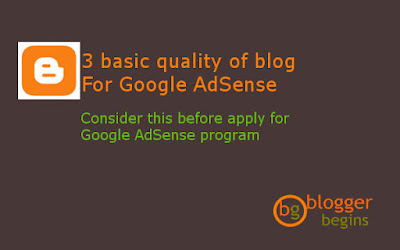 That is the very basic requirement for the blog that want to join Google AdSense program. The blog should has visitors. Blog owner as publisher want to get some advertisement displayed on their blog and get some earning by doing so. There are many 4 digit income report of blogger using AdSense program that make blogger has the dream to have the same income report. We should understand that nothing worth come in easy. It took a lot of effort for them, the successful blogger, to reach their position right know. A lot of of beginner blogger want to join Google AdSense program in a rush. They are starting a blog. Writing some articles and put a high hope submitting their blog in Google AdSense program without even reading the Google AdSense policy. I was one of them. I've been there before. The visitor goes to Google and search some information related with their daily life problem. They hope the articles that Google provided is relevant with their search. Google should only displayed relevant quality articles that can help the visitor of the blog. The visitor of the blog will see the advertisement displayed on the blog that they visit and sometime click the advertisement if it is fit to their needs. So it is clear the importance of the visitor. Without blog's visitor there will be no advertisement program. Without blog's visitor there will be no advertisement program. By understanding how the Google AdSense's work, who is the stakes holder and what is the stake's holder expectation, we can sensing what are the quality of the blog that eligible to be participant of Google AdSense program. The first quality that we need from a blog that eligible for Google AdSense program is the blog should have unique content that can solve people's problem . We must have heard phrases that said "Content Is The King". The traffic is coming only from the content. Without a unique content, the blog will have no visitor. The content must provide a reason for people to visit and read the article. It needs unique content since this content will compete with other articles form other blog in Google search. We can start with our daily problem and sharing the solution in our perspective. That is my method on writing the content in my blog. The second quality is the follower of the first quality. The blog that is submitted to Google AdSense should drive organic traffic. So it is not only number of visitor that matters, the traffic source is also important. The traffic from Google search page is very important since it drives most of visitor to the blog. This is again my opinion based on my observation and experience during Google AdSense approval process. The most visitors are coming from organic traffic, which means people are coming to our blog from Google Search result. When people try to find some information about anything, they will put in Google search. Google has algorithm in providing the blog content that relevant to the Google Search. Our article will compete with other article in search engine result page or shortened SERP. How many blog visitor that we need for Google AdSense approval? I don not have solid answer about this. In my experience, my blog has more than 200 visitor in a day when my account was approved. My other fellow blogger has 50 visitor in a a day when his application was approved. There are many tools that can be used to check our blog visitor. It is better to check this figure first before applying for Google AdSense program. The third quality is very basic. The blog that want to be Google AdSense partner should follow Google's AdSense policy. It is straight forward. If we want to play the game, we should follow the rule of the game. The blog that want to be Google AdSense partner should follow Google's policy. Most of people, including me, are lazy in reading term of service, policy, end user agreement and such kind document. In Google AdSense program, this is very important. At the beginning we should read the content policies. If our blog has one content that violate the Google AdSense policies, our Google AdSense application will never be approved. I've put the content policy in highlighted since this one of my roadblock in Google AdSense approval process. Based on my experience, I've been told that my Google AdSense application was rejected because of content policies violation. After did some research i found that one of my articles is talking about how to download video Youtube using certain application. It is again the Google policy. That's why we can not find those application in the Google Play Store. I think that's all that i can write right know. It covers the basic concept of how the Google AdSense program works and what are the quality of the blog that eligible for Google AdSense program. I hope it can help other fellow blogger in solving their problem. Any comment, share, suggestion... please feel free to put on the comment section. 0 Response to "Three basic quality of blog for Google AdSense"